Yuka Warm Heart Maxi | Kimmidolls Figurines | One Price Low Flat Shipping! From Enesco Giftrware's Kimmidolls Sentiments Doll Collection, Yuka Warm Hearted Maxi Doll. Made of stone resin. Measures 4.25" tall. Packaged in windowed gift box and comes with a collector's card describing this doll character's individual inspiration and spirit. I am Warm Hearted. My spirit is kind and caring, with a warm, generous heart. With your thoughtful and loving nature you share the warmth of my spirit bringing goodwill and friendship wherever you go. May the gifts of your heart uplift and bless the lives of all you meet. 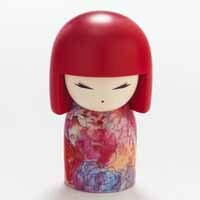 This uplifting Kimmidoll has red hair and is wearing a delicately patterned dress of soft reds, oranges, and blues in perfect keeping with her kind spirit. The kimmidoll™ brand was conceived following a long standing passion with elegant decorative gift and home ware items inspired by Eastern culture. 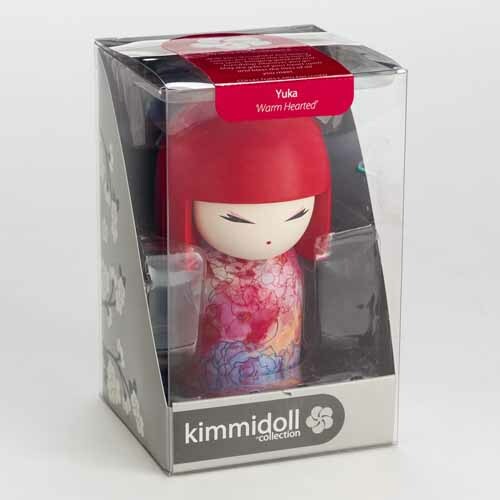 Kimmidolls™ are a modern west.ernized version of the traditional Kokeshi doll made to represent and celebrate life's true values. Kimmidolls™ stand out through their sophisticated and chic artistry. That artistry combined with their message makes them the perfect gift for yourself or someone special.